ENTERTAIN WITH WILDFLOWERS….Training for 2012–WHAT FOR? 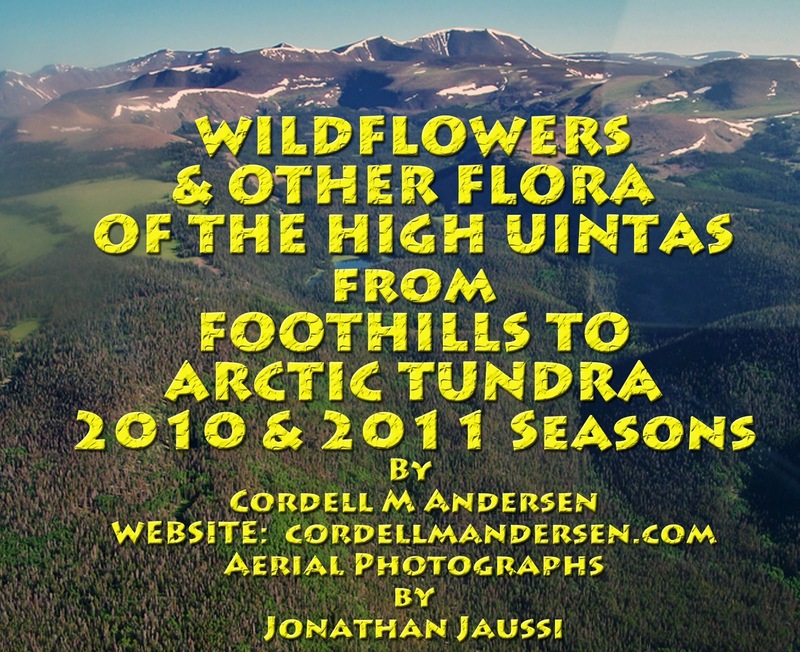 The video slide show begins with a couple of incredible aerial photographs of Crow Basin and Jackson Park, taken by friend Jonathan Jaussi (soon I’ll do a post of all his wonderful collection in preparation to conquer the area in August 2012). Thanks, Jonathan. To give you a glimpse of over 140 varieties photographed–around 40 new, I’ve put them all into a fast moving YouTube video slide show 12 minutes long. There’s no sound, nor attempt to identify them–yet. I will work on that during the long winter to ward off “cabin fever” and then do the big job of updating the wildflower albums in the Galleries section with THE BEST OF THE BEST–likely bringing the total varieties to around 280. In most cases I try and show the entire plant, then zoom in. If you enjoy the presentation, or any others on the website, a small donation would help keep the effort going. WHAT FOR 2012 (besides the Mayan end of the world!)? The “Forest Gump Moment” mentioned in my last trip report was only momentary. On that trip to Jackson Park and Crow Basin (YouTube video) I did so well doing the 6 miles to the car that I’m convinced I’m far from finished. So I’m now back in training at REAMS SUPERMARKET, in Springville to be ready for 4 trips in August of 2012. Drop by the store at 759 E. 400 South– I’d love to serve you while keeping in shape. I’m grateful for that opportunity to serve, and appreciative of the management and owners for giving me a job that literally helps keep me alive and raring to go in the Uintas and I’m even planning on running again (15th time) in 2012 the Coban International Half Marathon in Guatemala. Note: Supplements and anything you purchase from Amazon by clicking on my links, earn a small commission for the High Uintas Project, and you’ll get them cheaper and fast. INTERESTED IN KNOWING WHAT FOUR TRIPS? 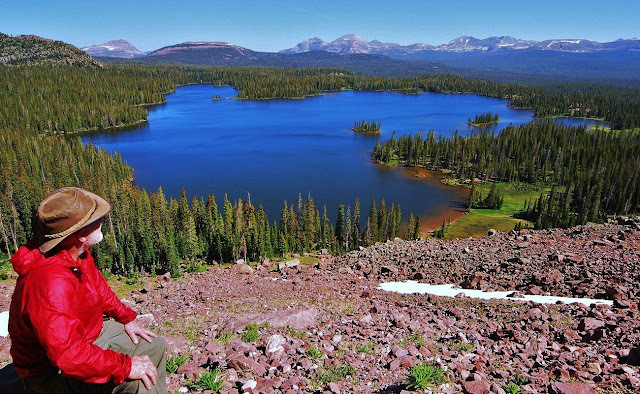 Tribune’s Outdoor Editor, Brett Prettyman, and published on Oct. 4, 2011. 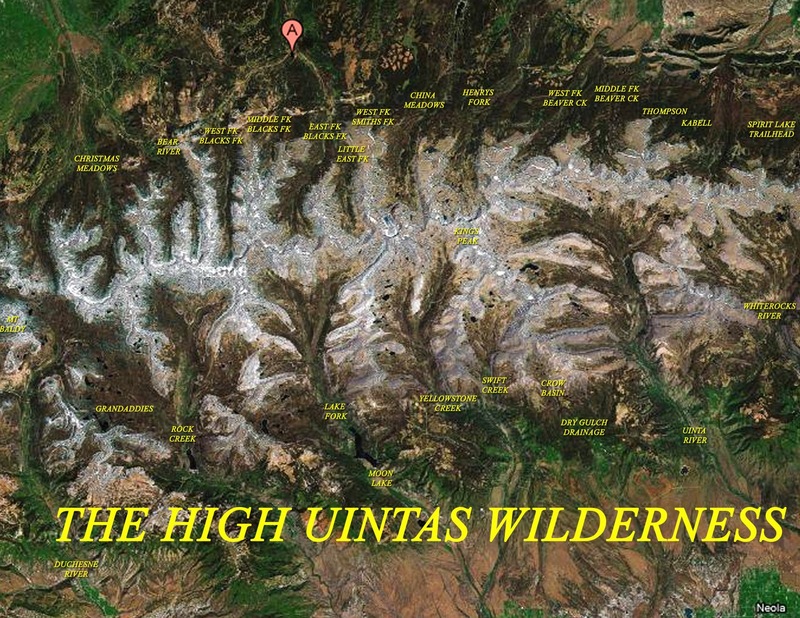 Thanks, Brett, for doing a great job reporting on the High Uintas Project. Apparently they changed the format of this section printing horizontally filling the whole page with the panorama of what some think is the most beautiful mountain scene in Utah–Triangle Mountain and Reconnaissance Lake (see it full screen and high definition at the end of this post–in several versions from dawn to twilight). 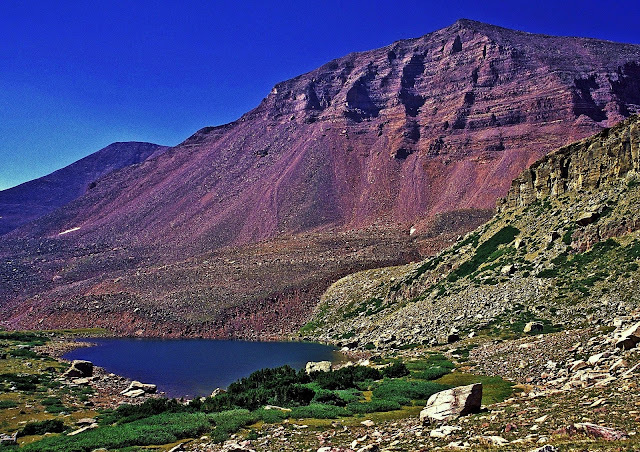 It is off-trail in the remote upper Rock Creek drainage of the Uinta’s South Slope and as far as I can tell has never been published before. I’ll show it, and all the 13 photos from the online version of the article, but include descriptions of each, and insert the magnificent record wild trout caught from some of them. Click on the link below to go to the article, and then come back to see the photo album with detailed captions, Comments, and Survival discussion. 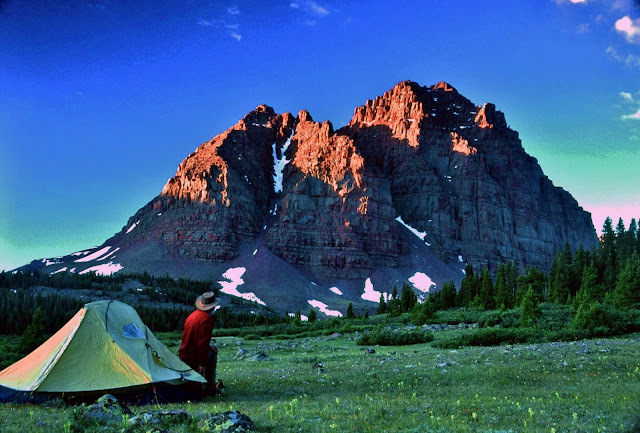 Link: LOVE OF THE UINTAS in the Salt Lake Tribune. 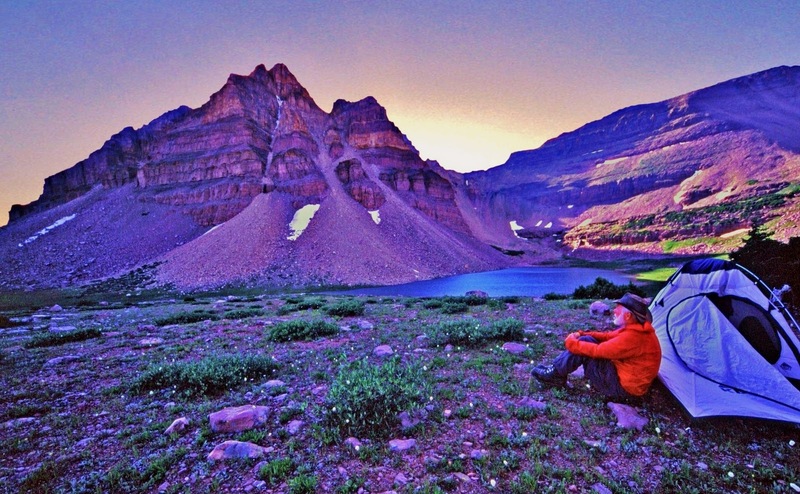 The Tribune’s caption: Cordell Andersen takes in the beauty of Red Castle Peak in the High Uinta Mountains. 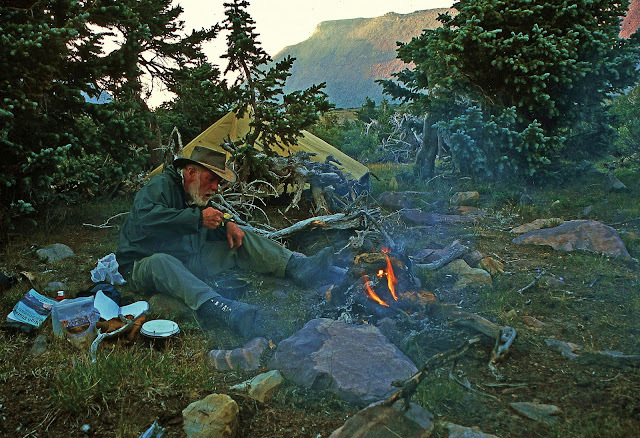 Below, Andersen enjoys a meal near Kings Peak. My comment: If you saw the black and white versions printed in the newspaper you will understand why the book I envision on the High Uintas must have mostly color photographs. Here I am crossing the arctic tundra of the upper Lake Fork drainage in mid-September when it turned into the survival experience mentioned in the article. Click on that if you want to learn the details. 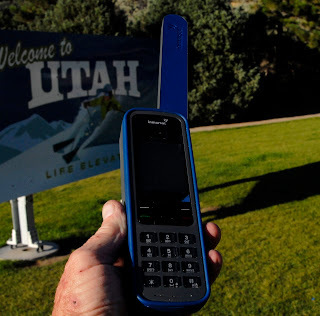 As mentioned when up at 12,165 ft. on the ridge in the background and in need I had a satellite phone and I was talking to Russ Smith from Skycall Satellite who “called in the cavalry.” The cost was covered by my insurance and my 10% deductible payment. I mention that as there were related negative comments in the Tribune’s online version. Scroll down to see them. Before continuing my review of the photos from the online Tribune article, let’s insert something else to set the stage for those who aren’t sure where the High Uinta Mountains are and how extensive. 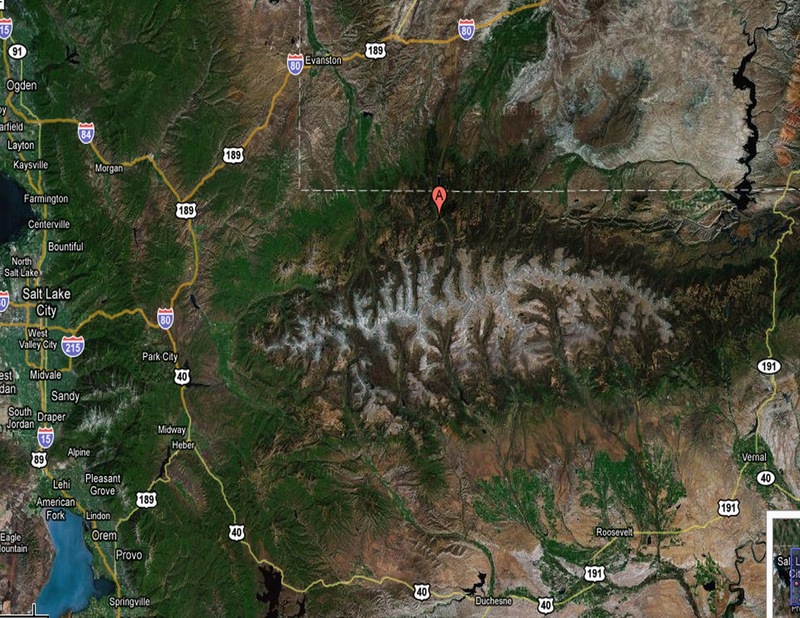 First a Google Earth view showing the Uintas in relation to the Wasatch front/Salt Lake City, Wyoming on the north, and Colorado to the east–this is impressive even for those of us who know the Uintas. 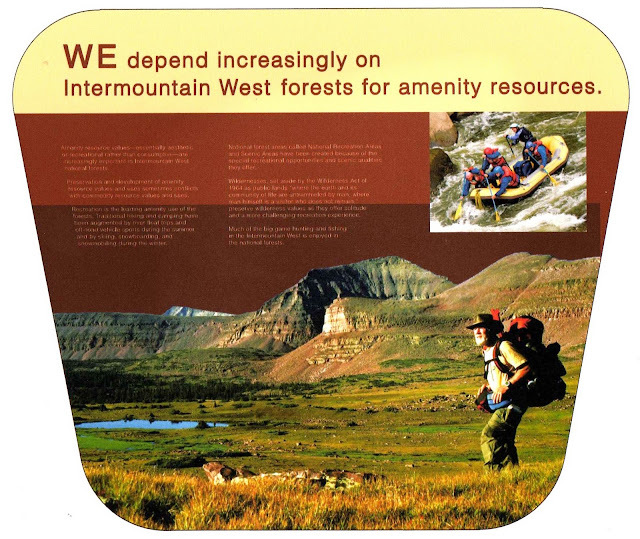 Below we zoom in on just the Uinta Mountain Range–actually the Wilderness Area, the light portions indicating the above timberline/arctic tundra areas which you can see are very extensive–only beat by the San Juan Mountains of Colorado. Now to the Tribune’s photo album of my photographs. This was the Tribune’s first of the online album. It is actually quite unattractive unless you know some detail. 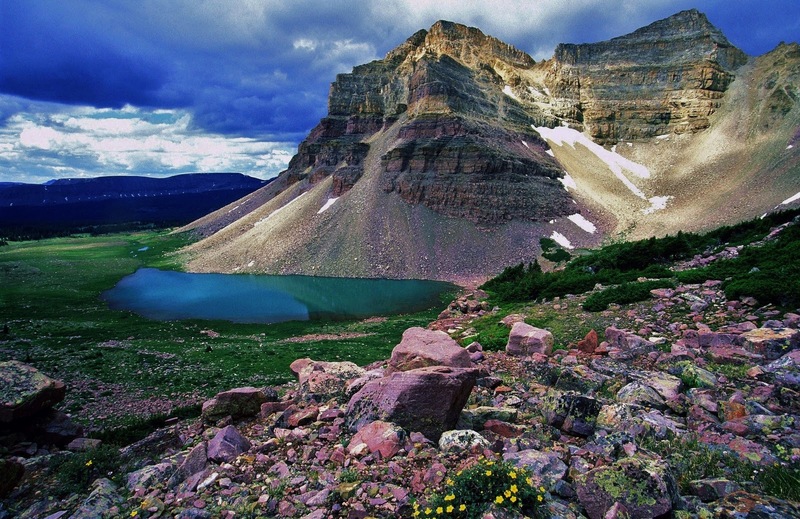 Their caption is: Beard Lake in the High Uinta Mts. .Let me tell you the rest of the story. 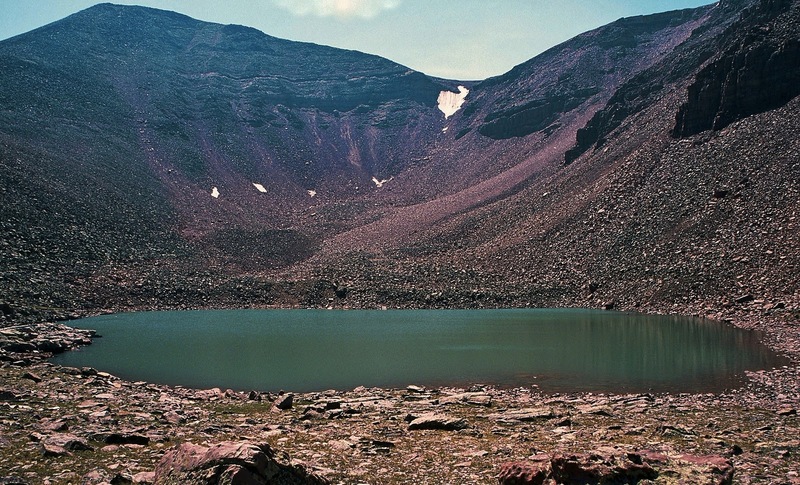 This alpine lake is near 11,769 ft. Trail Rider Pass, 20 miles from the nearest trailhead, between the Lake Atwood Area and the Painter Basin–all part of the Uinta River drainage. Above it is a no-name 13,247 ft. peak I call Beard Peak. To our right are the slopes of the 13,387 ft. mountain I have named Mount Jedediah which I’ll get to in a moment. Here, in what some maps designate as lake U-74, a giant hooked jawed Eastern Brook trout you see below grabbed my Thomas Cyclone. 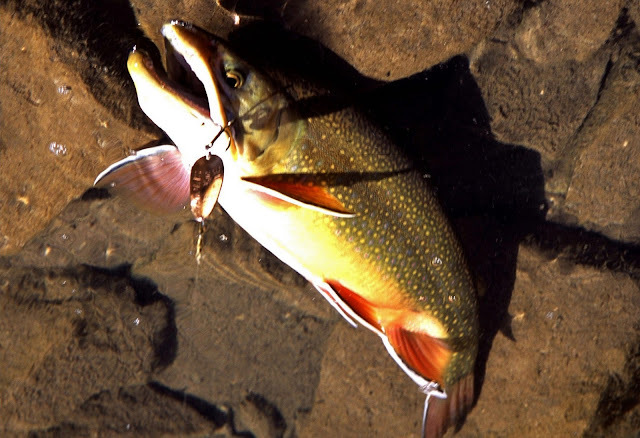 This brookie’s body descends down into transparent water about 3 feet deep. I let him swim around while getting out my tripod for a good picture of what I knew for sure was a new Utah State record by several pounds, but then he was gone. So we’ll never know for certain but his length was estimated at between 24 and 30 inches which would have had him weigh from 9 to 11+ lbs. 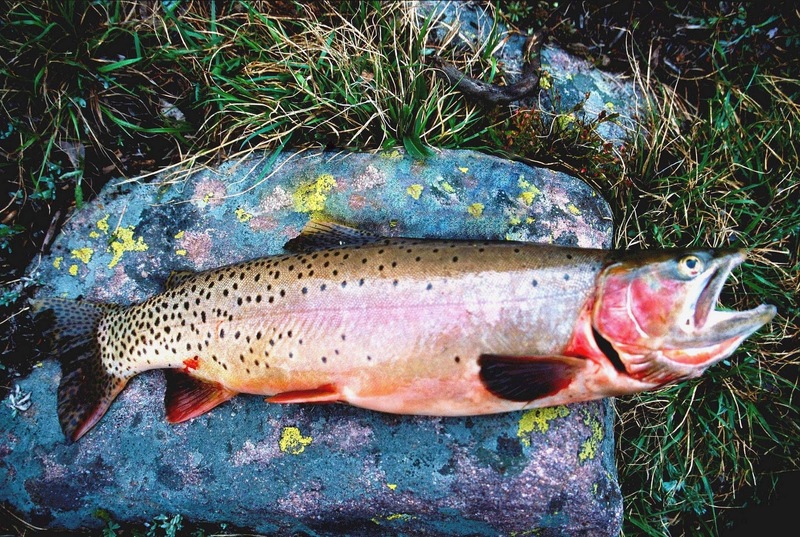 The Utah State record brookie weighed 7.5 lbs. from the Boulder Mountains. Whatever his weight might have been this brookie shows that the Uintas don’t have to play second fiddle to any other place in America. 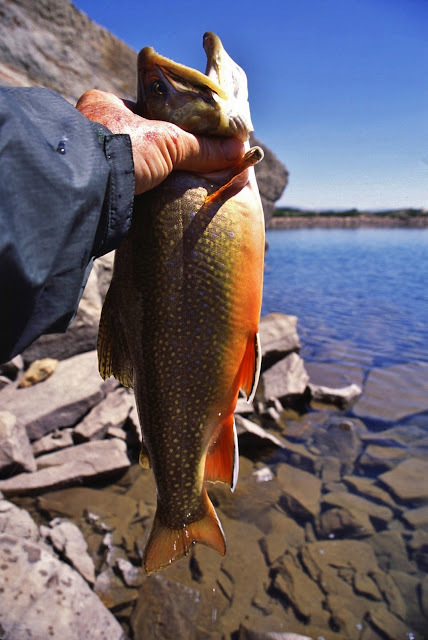 Click on the following link for a discussion on the world record brook trout. This is a little different version of the same picture in the Tribune album, composed and used by the High Desert Museum of Bend, Oregon for one of its displays. My caption for this picture in my Lightweight Backpacking article refers to my 27 day expedition. It is: Pumped up on the 11th day heading for Crater Lake. Equipment and food weight down to around 67 lbs. with a much stronger body. Believe me that doing this was about the most invigorating thing I have ever done in my life. But, no matter what your age, you shouldn’t attempt this without proper training and planning. Remember I trained for it for years, jogging daily, running half-marathons, and 2-3 times a week hiking 4 miles around the rolling hills of my farm in Guatemala with a 100 lb. bag of fertilizer on my back. Without this I would have never been able to do what I did–and enjoy it. If you’re not willing to pay the price, don’t attempt anything similar. In the center of the image is Explorer Peak and in a glacial cirque at its foot is found Crater Lake you see below. From the deepest, we go here to the largest lake in the High Uintas, Grandaddy Lake, one of the 26 lakes in the Grandaddy Basin, with well known mountains in the background: From the left, Mt. Baldy, Hayden Peak, Mt. Agassiz, and Spread Eagle Peak. With winter approaching in mid-September I got this panorama of the backbone of the High Uintas from 12,165 ft.* East Fork Pass (my name) at the head of the East Fork of Blacks Fork, with 13,219 ft. Mt. Lovenia out of sight far to our left, then Red Knob, in the distance to the right Mt. Beulah, and last at the edge of the image the slopes of 13,165 ft. Tokewanna Peak. 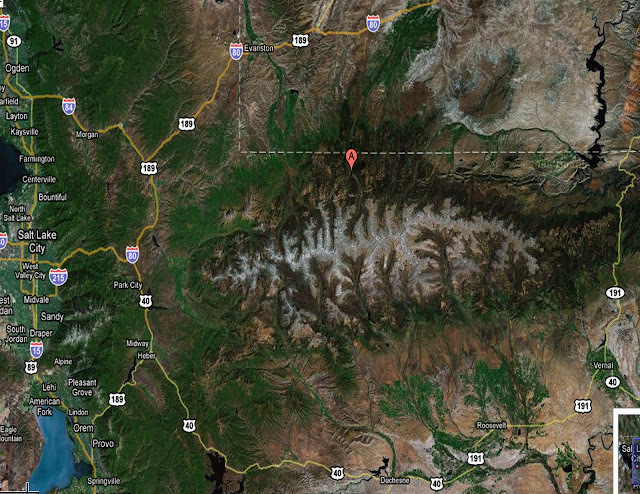 *Note:Previously on my website I stated that East Fork Pass was 12,300 ft. but I have corrected myself. KINGS PEAK as the setting sun turned it to gold, so far the only gold I have found in the High Uintas. This photograph was taken on the “survival backpack” as explained a bit further along and in the BACKPACK LIGHT and SURVIVAL segment where the image of my bivouac camp is also featured. Down the ridge south of Kings Peak we come to Mt. Jedediah that guards no-name U-75 lake where on my 27 day expedition I caught the large brook trout seen below. The 13,387 ft. high mountain, 5th highest in Utah, was (unofficially) named by me for who I think was the most outstanding of the explorers and mountain men of the west, Jedediah Smith. 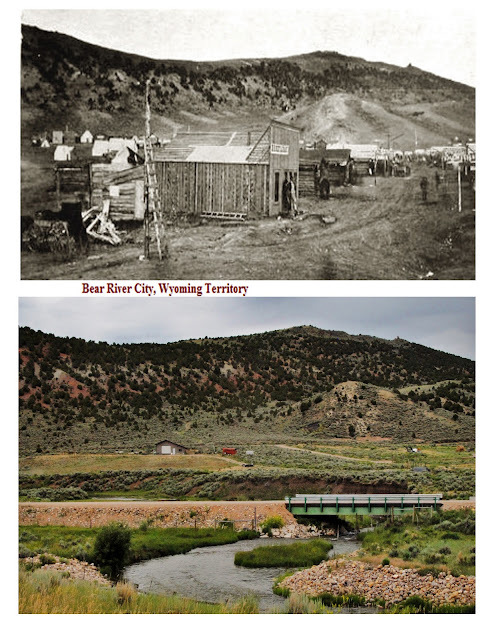 In my Crow Basin trip report I added about him: Smiths Fork, born in the Red Castle area on the North Slope, is also named in honor of Jedediah Smith, who along with his men first trapped the North Slope in the 1820’s. “Diah” as he was sometimes affectionately called was a giant among those early explorers different in that he carried (and read) his Bible, did not swear, nor drink and refused to have to do with women of ill repute. Here I insert another image related to no-name U-75. This fat brookie was 17 inches long and from 5-6 lbs. To arrive at that estimate I based the calculation on an 8 lb. cutthroat that was 21 inches long. Click on that and then the following to see the math logic involved. 11,130 ft. high East Red Castle Lake guarded by the multiple Red Castle Peaks was also another of those remote lakes that produced larger than normal native cutthoroat trout as you see below. 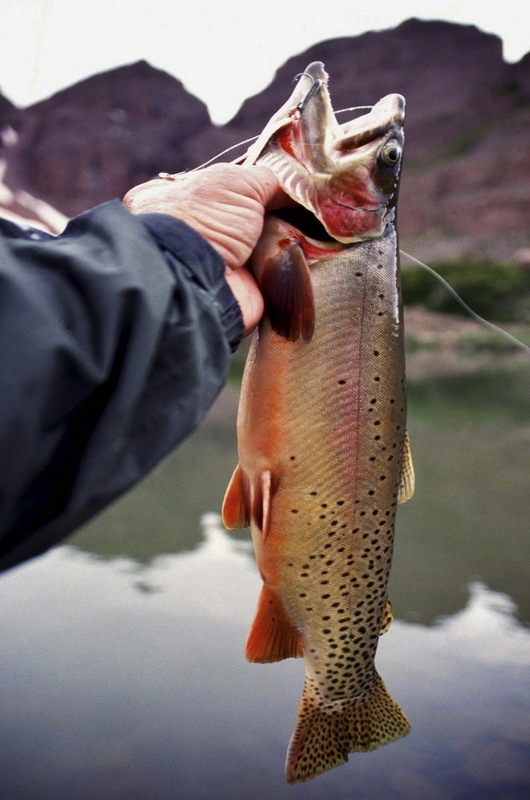 For more information on FISHING THE UINTAS, click on that link. 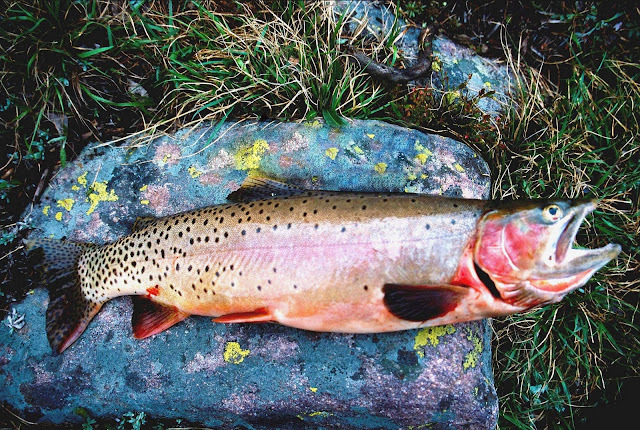 Another heavy bodied native cutthroat trout from East Red Castle Lake. Young Rocky Mountain Goat on East Grandaddy Mountain. 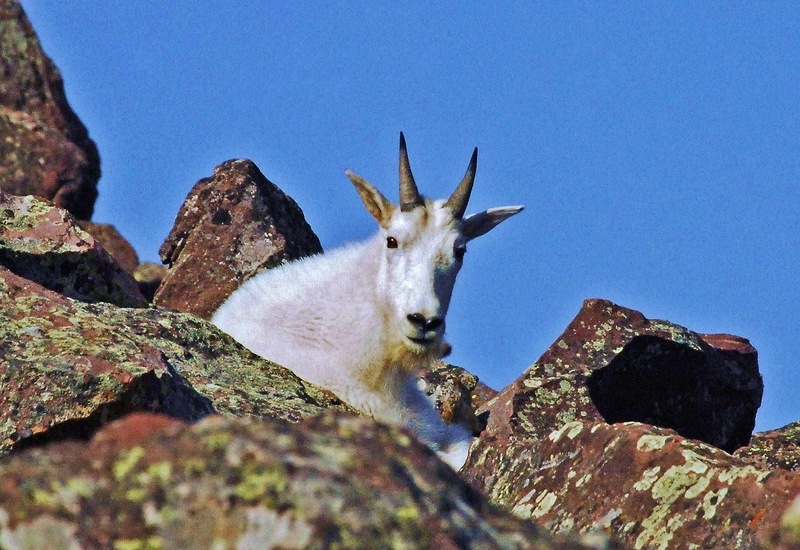 For photographs of most of the Animals of the Uintas, click on that link. 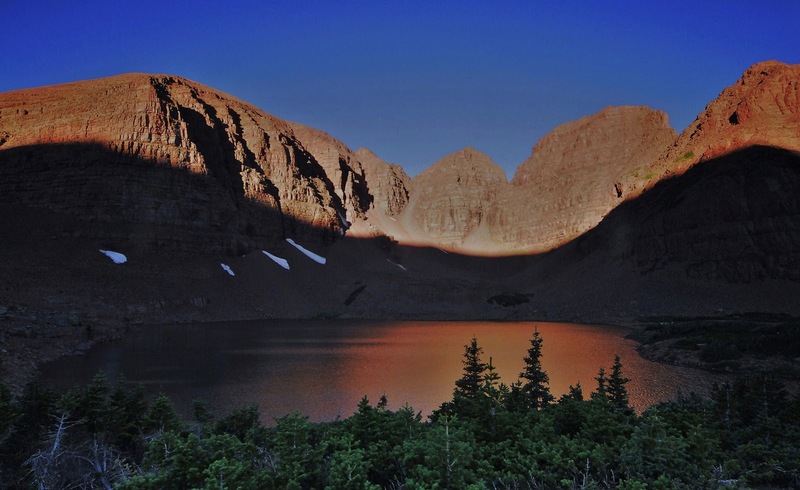 Go to the GALLERIES page to see Mountainscapes, Wildflowers, Origen and Rocks, Uinta Friends, etc. This shot will have to represent the continually growing collection of wildflowers. As soon as I have time to update the Gallery album with the new varieties I’ve photographed the total will likely surpass 250. The Tribune article also mentioned my exploration and research on the “tie hackers,” without whom the West wouldn’t have been won. My 7 photo essays on them can be represented by the opening page of one of them seen below. Links to all of them can be found on my Articles page. There is some exciting and fascinating history related to these incredibly tough guys who worked 12 months a year in the Uintas. Check out the reports, one of which is represented below in a 1867 photograph of one of their ghost towns–Beartown, described as “the liveliest, if not the most wicked town in America.” It grew to 2,000 people in 2 years and then disappeared like Sodom and Gomorrah. I found the exact spot as seen in the photograph below. This relatively unknown story will be part of my book. We now come to the full page spread in the Tribune article. We end where we started with this beautiful scene of Triangle Mountain and Reconnaissance Lake. I will not hang up my backpack until I can experience live one more time this incredibly inspiring corner of God’s great creation. Below see other views from daylight till twilight. In my 3 visits to the area I’ve never seen another human being and always had a truly wonderful wilderness experience. Click here for COMMENTS & CONTROVERSY from the online Tribune article. Click here for related SPOT TRACER DEMO and SURVIVAL issues from the article. Going alone seems to be an issue with some–and it should be. I don’t advise it with anyone, unless they can meet my criteria which I explain in the next few paragraphs. Links to get more detail are highlighted. 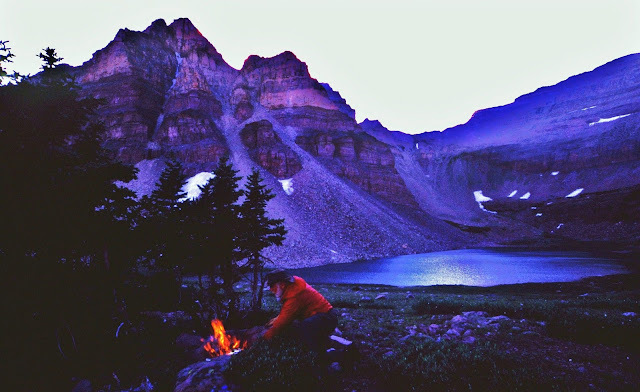 In the ARTICLES section of my website I have a category called Survival articles, in which I explain the important precautions I take every time I go on a trip. Check out the 7 experiences and be prepared to LIVE. Even if you understand all those experiences and the principles involved, I’ll have to admit that it still isn’t a good idea to go alone–but, if you must because of being stubborn, or sort of dense–I guess like me, be aware of the precautions I take, and do the same or better. First, I let family and friends know exactly where I’m going and leave with them copies of the topographical route maps and my daily schedule (click on that link and check out 3 photo views to see what I mean). In recent years this is outlined on my website on the Schedule page, with links for each trip to the topographical route maps. Click on those links to see what I’m talking about. Second, I was a Medical Corpsman in the Army and then upgraded to Medical Specialist. I then lived for 37 years in the backcountry of Guatemala where I performed thousands of emergency treatments each year, even minor surgery, so with that training, background and experience, plus knowledge of my body, I go prepared for nearly any possible emergency. Once again my survival and Lightweight Backpacking articles mention the essentials, including the right kind of clothes, rain gear, and attitude, including faith. Third, as mentioned I always have a satellite phone which I encourage every group to have, and anyone who goes alone. Until the emergency mentioned in the Tribune article it had only been used twice for emergencies in nearly 5 years. Those were when I loaned it to Scout groups with serious problems. Any time I make an important deviation from my schedule I call and advise. On my 27 day expedition I called the family every night at a designated time. At that time in 2003 there didn’t exist yet the SPOT Tracker, mentioned next. Remember you can rent a sat phone and SPOT Tracker from Russ Smith at Skycall Satillite. Fourth, I always have with me my SPOT Personal Satellite Tracker. Before leaving I program it on my computer for the trip I’m taking, including an OK message to email daily to 10 on my list. With that email they can click on the link and go to Google Earth and see exactly where I started and where I’m camped each evening. I also leave what they call a “bread crumb trail” that can be accessed from the SPOT website using the link I put on my website, available to all for each trip and emailed also to all my High Uinta Friends. NOTE: So you can see what I mean I’ll program the SPOT Tracker now that you can access by clicking on this LINK Note: The link was only good as I describe next for 7 days. For this demonstration it took you to my home in Springville and area with a breadcrumb trail. That is what you saw if you clicked during the first week. 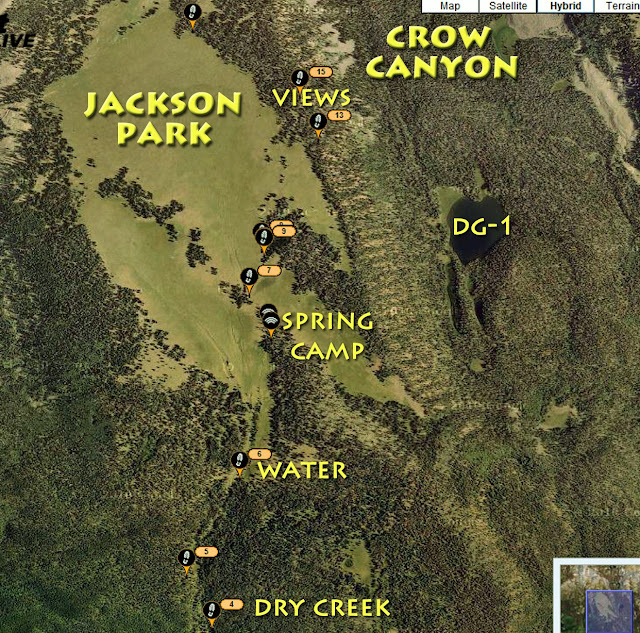 What shows now is when I went on the deer hunt and used the SPOT where I camped that night. So you can see what I mean I’ll insert below a photo of my SPOT tracks from my last trip to Jackson Park and Crow Basin. NOTE: In doing this demonstration I found that the SPOT Tracker will work through the glass of your windshield . The SPOT is also programmed with a Help message to be sent to 4 special friends with special info like health issues, etc. With that message the 4 friends would have to take action, and they would know exactly where I was. Then of course there is the 911 button that triggers Search and Rescue showing them exactly where to go. 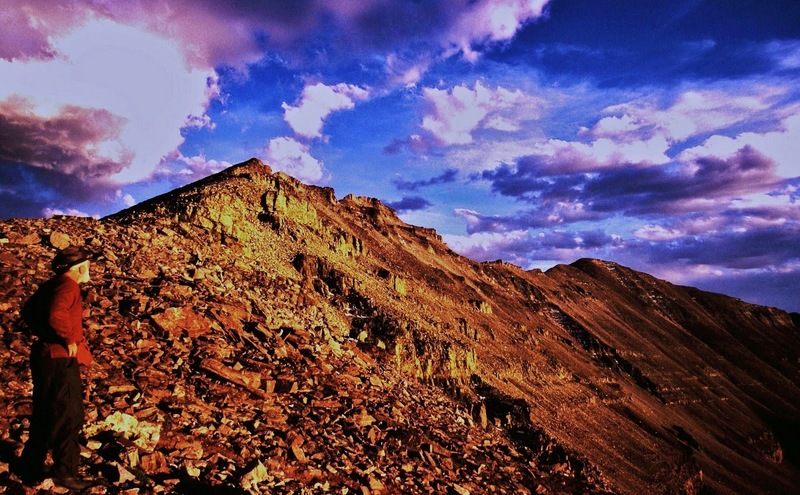 Get a SPOT Tracker cheaper than anywhere, and earn a commission for the High Uintas Project. Last of all, as shown in my last YouTube Video (#7), and in the photo above, if I leave my pack I always clip the SPOT Tracker to my belt so it can be easily accessed in case of emergency. That survival story is told in more detail in the photo/essay of that name. The pessimist, or fearful, might say that even having all the emergency gadgets you might be in trouble having a heart attack, slipping and hitting your head on a rock, falling into a ravine or whatever, and not be able to use your SPOT Tracker. Of course all those things, or equivalents, could happen to you every time you leave your home, or even in your home. Having and using a SPOT Tracker every day in the wilderness will at least show where you were yesterday, if not heard from today, and that combined with a trip plan of where you were to head next will make the search relatively easy. 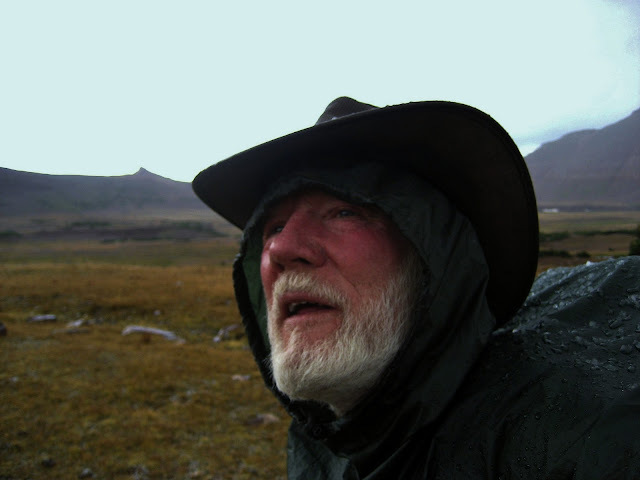 From this season I also had another survival YouTube video that is Video #4: Survival at Swasey Hole that one viewer called “genius.” I’m not sure why……. guess I’ll have to look at it again. 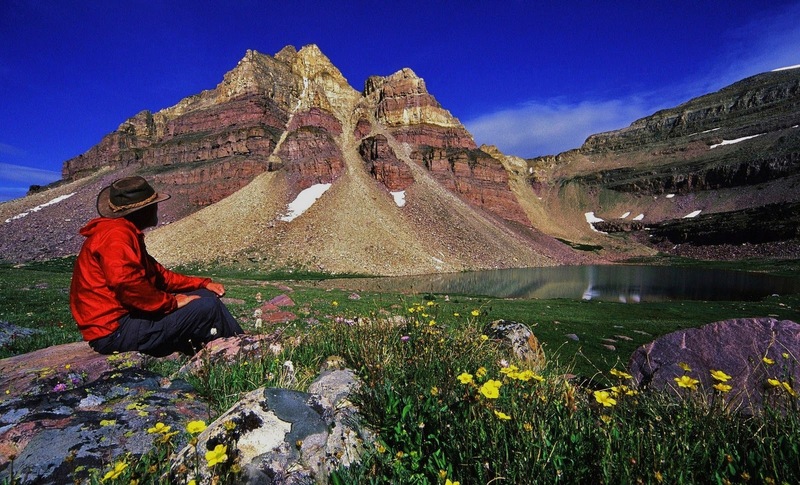 This discussion isn’t over without mentioning Eric Robinson, the 64 year old Australian lost in the Uintas and never found this past season (2011). He had a Personal Locator Beacon but never used it. It obviously worked out being a mistake for him to go alone ( in my opinion, UNPREPARED), so of great importance it’s worth repeating that he apparently didn’t take any of the precautions I take. I use my SPOT tracker several times each day–at least assuring those interested where I was yesterday giving them a good starting point and hopefully avoiding waiting 7 years to get the insurance money! Just follow the simple rules and have a wonderful time in the great outdoors–and make the wait for those at home relaxing, worry free and fun knowing each day you’re still in the game and you’ll be home soon. 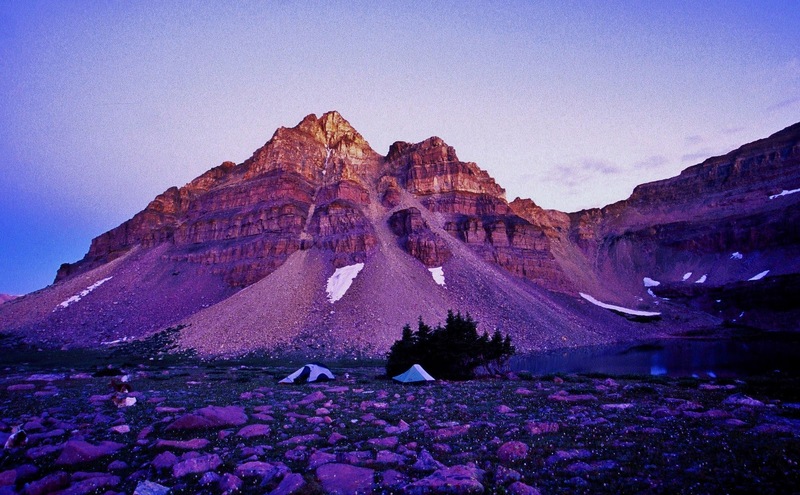 NOTE: At the end of this post I will insert what I recommend should be done by everyone going into the wilderness to avoid what happened to Eric Robinson this past summer in the Uintas. He is the 64 year old Australian lost in the mountains. My recommendations would avoid such happening in 99% of the cases. “Wow. Incredible story and an incredible man. An inspiration to us all. The Uintas truly are legend. So unique in how they are built. Massive unbroken stretches of tundra, the like of which do not exist below Canada or Alaska. I am still learning of the wonders of the place. So many hidden waterfalls, hanging lakes and hard to access places and peaks. “That is simply awesome Cordell! What a great article about a truly amazing man and some magnificent country! “Great article Cordell! 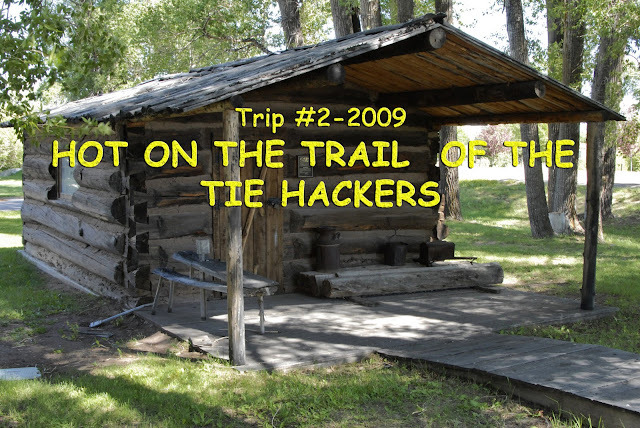 I was just Deer hunting last week near Suicide Park and saw many tie hacker cabins I had never seen before. I immediatly thought of you:) I think I’ll try to get into Crow lake next year thanks to you. “Hi Cordell. Im glad that you are reconsidering your ‘Forest Gump Moment.’ We enjoyed your reports over the years and look forward to the next summer to do it all over again at KSL Outdoors Radio. I found out about you while reading the recent Tribune article. The love of my life has also been the High Uintas. There were so many places that I wished to explore, but a series of health problems and my age have prevented me from getting there. 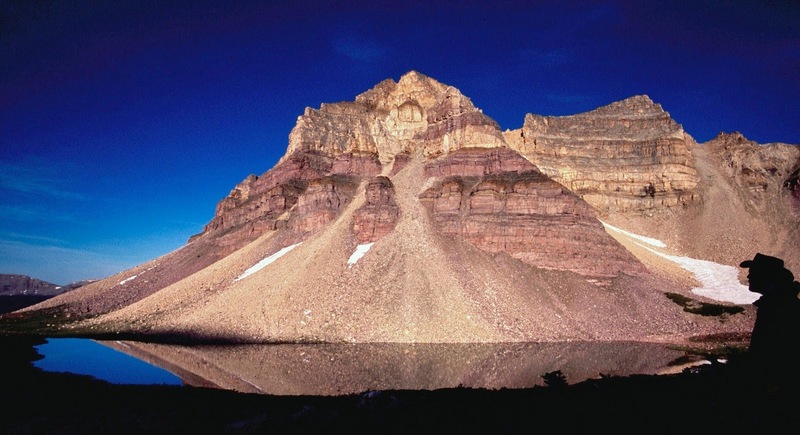 While I have done many day hikes and a few short backpacks in the Uintas, I have dreamed of getting to places like Red Castle and Crater lake. You have brought those places to me. Your photography, determination and stamina is awe inspiring. The Uintas have provided me with such spiritual rejuvenation and I can tell, for you too. In fact, I call myself a “Uintatarian”! The fish, oh my! The spectacular mountainscapes. Thank you so much for bringing these great places to life for me again. Oh how I wish I could do what you do.